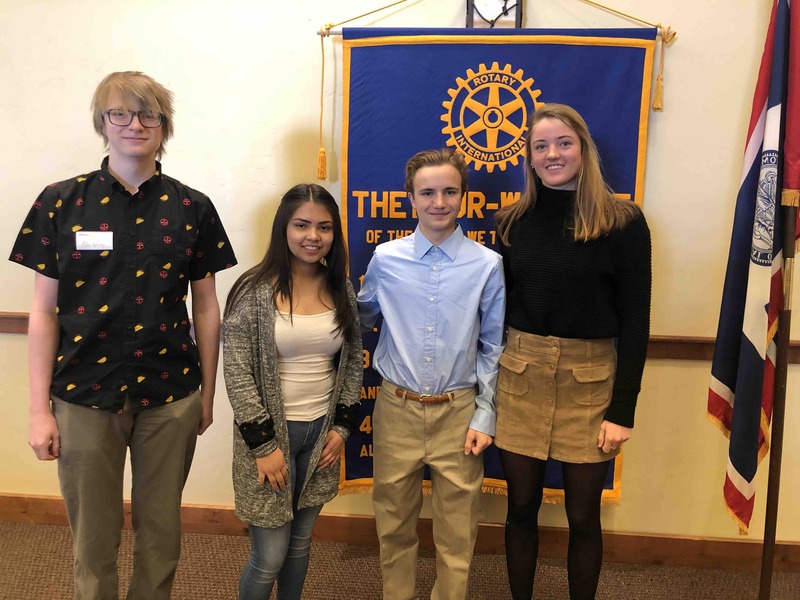 The Jackson Hole Rotary Lunch Club presented its “Students of the Season” awards Tuesday, recognizing outstanding high school students from Jackson Hole High School, Jackson Hole Community School, Teton Science School, and Summit Innovations High School. Dr. Scott Crisp, Jackson Hole High School Principal, introduced Rotary to senior Annabelle Hagen. Among her many athletic accomplishments, Annabelle is a 4-time Wyoming Nordic state champion. Hagen cited her Jackson roots and the history of her family as examples that “grit and perseverance” will help her find future success after high school. Annabelle will attend Harvard University in the fall where she will be a skier on their Division I Nordic Ski Team. Pier Trudelle, Summit Innovations High School Principal, introduced us to junior Riley Kirkley. Genuine, true to himself, with a service above self, are some of the ways Trudelle described this remarkable junior. Kirkley mentioned both parents as a foundation of support and encouragement and thanked his dad for introducing him to storytelling, a passion of his. In his speech, he made sure to give much credit to Summit and its faculty for helping him realize his potential and allowing him to thrive. Amy Fulwyler, JH Community High School principal, described student Aleimi Garcia Briones as an independent and confident person with sincere gratitude for the opportunities in her life. Aleimi is committed to her academics and the community, while helping her mom with her three younger siblings. Sean Groenstein has been a student a Teton Science School for 14 years, beginning in the Pre-K 3 program. Head of School, Nancy Lang, described Sean as open-minded and curious while calling to attention to his two years in the Wyoming All-State Band as a flute player and his gift in mentoring younger children on the Journeys campus. An avid kayaker, who relishes being outdoors, Sean hopes to study Environmental Science to advocate and project the outdoors that have given so much to him.